"Well, thanks for the note. I wrote to another person in your company to thank them for their prompt service. 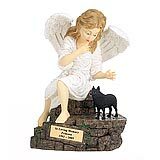 We are very happy with the quality of the product we purchased from you. The transaction was problem free and we would recommend (and already have recommended) you to our friends. 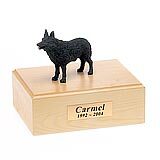 Sam's ashes sit in a place of prominence in our home, and he lives forever in our hearts..."
All available Schipperke dog urns and memorials will be displayed with the figurine on the Schipperke urn you select and in the appropriate size.